Georgia is as sweet as its official state fruit, the peach. The climate is almost always warm if not hot in Georgia. And its landscape is as colorful as they come, boasting a rich tapestry of Blue Ridge mountains and lush forests in the northeast, rolling hills and rivers in the fertile soils of central Piedmont, low-lying marshes in the south, and spectacular beaches along the coast. As the largest and wealthiest of the old Southern states, Georgia is also known as the “Empire State of the South”. And it can back this up. If Georgia was its own country, it would boast the 18th largest economy in the world. Its residents are among the wealthiest, enjoying an annual per capita income of more than $40,000. This “Peach State” not only produces a sea of peaches, but an array of agricultural goods that includes pecans, peanuts, cotton, pulp, vegetables, poultry, pork, and beef. Its manufacturing prowess does not lag behind either. Georgia manufactured the first steamship to cross the Atlantic in 1819, the first nuclear-powered ship in 1959, and the first cotton gin, which resident Eli Whitney invented in 1793. Today, Georgia is responsible for the manufacturing of automobiles, aircrafts, chemical products, and above all else, marble, which is prized throughout the globe. Georgia has been settled by Native Americans including the Cherokee and Creek since at least 800AD, as evidenced by prehistoric mounds, which can be found at present-day villages like Ocmulgee and Etowah. The arrival of Europeans, starting with Spanish conquistador, Hernando de Soto, introduced diseases to the Natives, which killed a majority of their population. Starting in the late 17th century, the British and Spanish fought over Georgia. The British set up the Georgia Colony in 1733 and were able to fend off the Spanish, largely thanks to the shelter provided by Georgia’s barrier islands. After the Revolutionary War, Georgia began growing cotton after Eli Whitney’s invention of the cotton gin in 1794 made such endeavor profitable. Slaves were brought in to work the cotton plantations. In 1829, gold was discovered in the Georgia Mountains in the north, triggering America’s first gold rush. The influx of white settlers attracted by the gold pressured the government to force the Native Cherokee off their lands, culminating in the Indian Removal Act of 1830 and the Trail of Tears when the tribes were relocated to Oklahoma. During the Civil War, Georgia was invaded by General Sherman’s army who succeeded in blocking off the state from access to the Mississippi River and eventually captured and burned Atlanta. After the Civil War and throughout the first half of the 20th century, Georgia was shrouded in racial politics. Freed black slaves were regularly lynched and murdered. The Ku Klux Klan was founded with significant support from Georgia members. The state also instituted a convict lease system whereby convicted black prisoners were leased to capitalists and effectively treated as slaves. During the Civil Rights Movement, Georgia was a major battleground for Martin Luther King, Jr. and his cohorts. And after the success of the movement, the state was the first in the South to elect an African American to Congress in 1972 and the first to elect a black mayor in 1974. Today, Georgia remains a pillar of the south, a leader in agriculture, textiles, and industry and a haven for United States military installations. 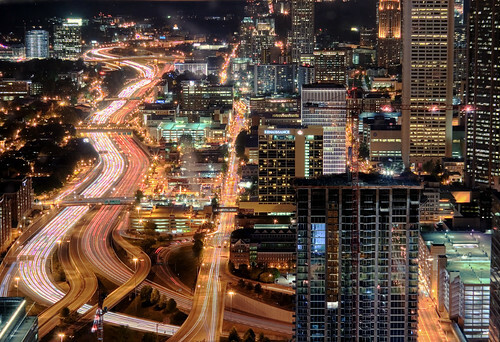 Most of Georgia’s major tourist attractions are found in Atlanta, where the largest aquarium in the world, the Georgia Aquarium, and the World of Coca Cola Museum draws millions of visitors. Atlanta also features numerous amusement parks like the 3,300 acre Stone Mountain Park, which is popular for outdoor activities like hiking, cycling, archery, tennis, camping, fishing, and golfing, and also features the largest granite bas-relief in the world. Carvings that memorialize the Confederacy decorate this granite. The Zoo Atlanta is also popular among family and kids for its gorillas and giant pandas, among other animals. In the north, the Georgia Mountains welcomed America’s first gold rush. You can visit the Dahlonega Gold Museum there to learn all about it and go panning for gold yourself. The same region is home to the Unicoi State Park, which is only a few miles from Helen. The park offers scenic trails, mountain vistas, cascading waterfalls, and the Cloudland Canyon. In central Georgia, Macon is home to the Georgia Music Hall of Fame, which honors the likes of Ray Charles, James Brown, Trisha Yearwood, R.E.M., Alan Jackson, and Jermaine Dupri. The Georgia Sports Hall of Fame in the same town honors Ty Cobb, Hank Aaron, Herschel Walker, and Tommy Aaron, among others. Perhaps more impressive is the town’s Ocmulgee National Monument, a 700 acre site rooted in Native American history dating as far back as 12,000 years. You’ll find ceremonial centers, prehistoric mounds, and earth lodges. Also nearby is the town of Andersonville, home of the notorious Confederate prisoner-of-war camp. Because of the limited supplies of the Confederacy during the Civil War, being captured and sent to this prison was an effective death sentence by starvation. In the central-east, you can camp out at the Providence Canyon State Park which is layered with wildflower fields amid its 150 feet canyon. It is considered one of George’s “Seven Natural Wonders”. Nearby is the Jimmy Carter National Historic Site in Plains, Georgia. This is the childhood home of the former U.S. President. The central-west region is anchored by Savannah, where you’ll find rejuvenating spa centers like the Westin Savannah Harbor Golf Resort and Spa. The city itself is historically charming, featuring 19th century inns like the famous Gastonian and other Victorian buildings lined along its stroll-able streets. Near Savannah is the “Little White House” at Warm Springs. This is the cottage where President Franklin D. Roosevelt retreated for vacations in the hopes of improving his paraplegia. The Georgia coast features Hog Hammock and Sapelo Island. The latter is one of the few surviving ethnic African American communities in North America, carrying traditions and values that date back to the early 19th century. The Sapelo Island, on the other hand, offers magnificent views especially atop its 1820 lighthouse. Also on the coast is the Gray’s Reef National Marine Sanctuary. Its sandstone reef and underwater marine life makes it a scuba diving destination. Jekyll Island Club is of interest as well, located on Jekyll Island. It used to serve as the lavish cottage playground resort of millionaires during the late 19th and early 20th century. It is now a historic district still enjoyed for its trails and beaches. In southern Georgia, you’ll find the mysterious and ancient Okefenokee Swamp, the largest blackwater peat-based swamp in North America. It is visited by 500,000 people each year. It is a wildlife refuge that is best toured by kayak, motorboat, or canoe. You’ll be able to spot alligators, black bears, wading birds, egrets, herons, and ibises, among other wildlife. While you’re in the region, be sure to visit the town of Dawsonville, home of the Kangaroo Conservation Center, whose 90-acre wildlife sanctuary is home to the largest group of kangaroos outside of Australia. In the same region, the Reed Bingham State Park near Valdosta offers a park roamed by wild turkeys and centered around a 375-mile lake – a great fishing, camping, and hiking destination. The town is also home to the Wild Adventures theme park and its rollercoaster rides.